The tourist sites are categorized into three depending on the location. 1. Akiyoshidō cave & Akiyoshidai observation deck area which is within walking distance from the bus terminal, 2. Northern Akiyoshidai area which includes Taishodō cave, Kagekiyodō cave, Safari Land, and others, and 3. Others that are Beppu Benten Pond, Ofuku area, Ōmine area including Mine Sta. 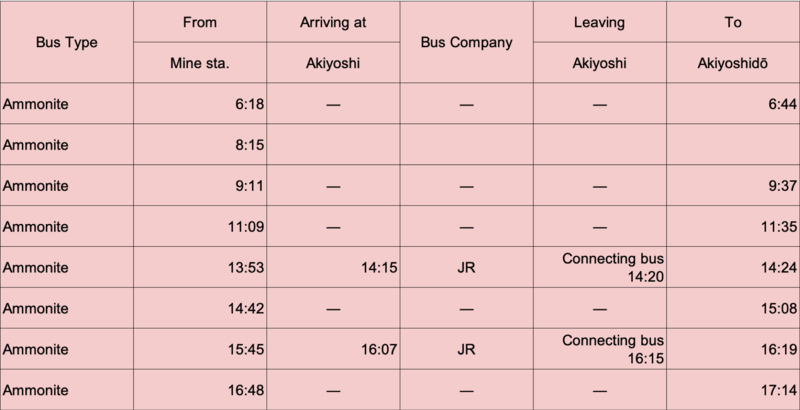 We recommend you to plan based on the following timetables in advance since there are few buses in all lines. The loop bus runs from Akiyoshidō bus terminal near the main entrance of the cave and drops by the other side of the cave, Kurotani entrance and then, Akiyoshidai. The observation deck, Karstar, and Akiyoshidai Museum of Natural History are all near from Akiyoshidai bus stop. Karst Taxi, a minibus or a shared van stops more places aside from the mentioned above. 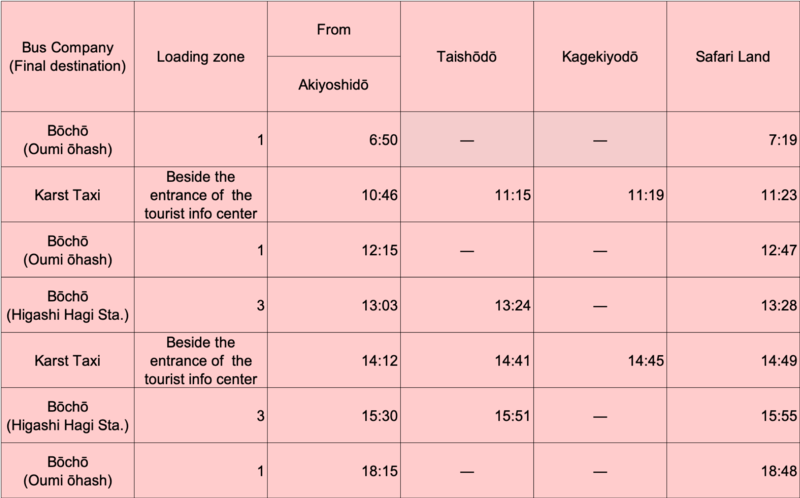 The elevator entrance is included in the loop and some buses go to Taishodo, Kagekiyodo, and Safari Land. Find a green stop. 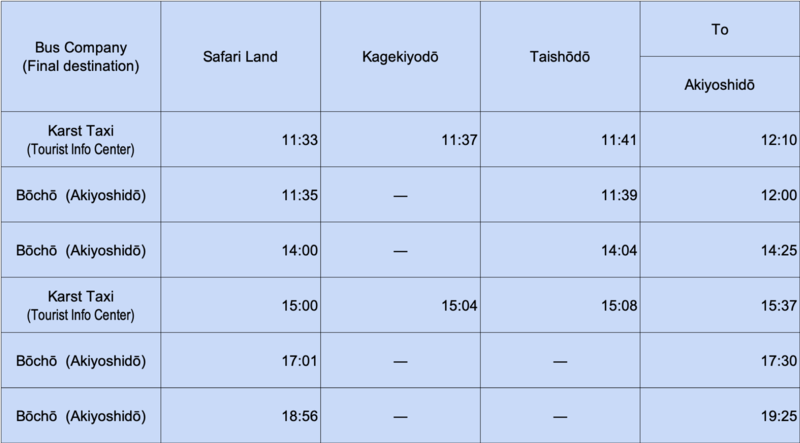 For cave lovers, please check out the recommended schedule for the cave walk. Payment Tourist info center, in-car(cash only). Cash only for Karst Taxi. *In case of transit, please tell the driver that you will make a connection to another bus. Akiyoshidō bus terminal loading zone 1→Community bus “Ammonite” to Mine Sta./ Mine shiritsu byōin→Mine Sta. *Please ask the driver for the connection ticket. *In case of transit, please inform the driver that you will make a connection to another bus. The driver will issue a connection ticket for you so that you will not be charged.